"In Anagnorisis: Poems, the award-winning poet Kyle Dargan ignites a reckoning." "Dargan’s fifth collection takes its title from the literary term for a moment of sudden recognition. Here, it amounts almost to resignation — about the country’s racist brutality [...]." "Dargan is a master of threnody: lines tensed and pulled so much that his poems shake the page. He’s writing within an American language that is broken […]. Anagnorisis is a book of the inevitable[.]" "There’s a six-page masterwork entitled 'In 2016, the African-American poet Kyle Dargan is asked to consider writing more like the African-American poet Ross Gay.' This referendum on “joy” is insightful and eye-opening[.]" "Kyle Dargan has a wonderful ability to distill moments and show us their wider implications in tight, controlled, strongly crafted lines. I’m excited to share this book with our members." "The collection has many poems that illume my imagination in ways I cannot fully explain, but I am going to try. One such poem is “In 2016, the African-American Poet Kyle Dargan is Asked to Consider Writing More Like the African-American Poet Ross Gay”. I don’t think I’m being over the top when I say this poem demands to be read by creative writing students and teachers worldwide [...]. I can assure you that Dargan succeeds in his desire to be humanly whole with this poem and with this book. It’s a book of our time and for all time. Read it." "It is difficult to read this collection of poetry without noticing its many contradictions, which serve to shine a light on the contradictions that persist in the current environment. Many of us claim that we do not discriminate, while at the same time enjoying our lives of privilege without realizing it. One of the core questions the speaker of these poems confronts is whether he wants to be seen or to stay hidden. Put another way, should the speaker resist and question what has become the norm or should he accept the norm and stay hidden, which, perhaps, is safer." "Anagnorisis bridges cultures and challenges identities. The poems explore landscapes and take risks. Dargan intentionally provokes mixed reactions with the collection’s political content, content which is satirical, profound, and exact. And all readers will admire Dargan’s ability to challenge differing points of view, via careful use of images, which is paramount to strong poetry." The poems in Anagnorisis are weightlifting; repeatedly pushing the burden of current events—the gentrification of DC, the numberless black deaths at the hands of authority, US/Global relations, our rapidly altering ecosystem— away from chest, trying to hold them at a distance, only to pull them back and attempt to master the muscle required to survive and write and celebrate in times like these. “Rage would be a word to fit in the mouth/ had the mouth not grown small from watching” Dargan writes, and does the work of gracefully making room in his poems to get eye-to-eye with a people’s mammoth rage, and also remind us of the daily, small, and enduring hopes we must have for a better nation and world. In Dargan's Anagnorisis , what can be called 'disillusionment' is life torquing into complication and deeper possibilities. Here, communities in the micro and macro mangle and contort the speaker out of his focus on systems of oppression and onto oppressed people, decimating all distractions for charismatic calls for joy—'Yes, I am thankful, / but I cannot accommodate you / inside my gratitude,'—such that the speaker can, with wisdom, 'know how a song / do & don't tell.' Dargan leaves no social upheaval untouched. Ecopoetic, internationally erudite, and chiseled by love, these poems 'know the phenomenon that is judgment,' making a torch song into a brilliant resurrection. Anagnorisis is a book of riveting intimacy and of national significance; a reckoning with this terrifying immediate moment: Trump-times and macho disasters. Yet it is also a book of unsentimental and profound hope in flesh and blood everyday-living people. It is a book of “Dee Cee” and a book of America. Dargan’s words are restrained, matter of fact and yet spell-binding. The landscape, the sound and the rhythm are gorgeous and true. His stories are throat catching. Anagnorisis will endure. Dargan is at once our poet and our poetics. In this his fourth collection, award-winning poet Kyle Dargan examines the mechanics of the heart and mind as they are weathered by loss. Following a spate of deaths among family and friends, Dargan chooses to present not color-negative elegies but self-portraits that capture what of these departed figures remains within him. Amid this processing of mortality, it becomes clear that he has arrived at a turning point as a writer and a man. As the title suggests, Dargan aspires toward an unflinching honesty. These poems do not purport to possess life’s answers or seek to employ language to mask what they do not know. Dargan confesses as a means of reaching out to the nomadic human soul and inviting it to accompany him on a walk toward the unknown. "Honest Engine’s ultimate lesson is that home is the place of the necessary labors. And as the book that highlights a four-volume journey though the rough terrains of America, it’s a refreshingly prayerful and sympathetic view." "What does it mean to deceive? To be honest? To believe? To doubt? What does it mean to be a man? A son? A lover? A black man in America, or anywhere? 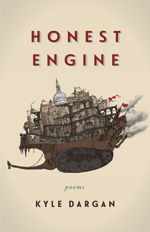 The poems in Honest Engine step into the roil of these questions with a fierce intelligence matched by stores of humility and compassion, boldly exploring the 'point at which good is susceptible / to chaos’ seduction,' where frustration might tip into violence." "Dargan's language, though dense at times, allows enough porosity to invite the reader into the poems, and into the questions they posit about our understanding of masculinity and of what it means to be a black male in America [...]. This book should be required reading for anyone who might be curious about the accumulated struggles, confusions, fears, and triumphs that one man has the courage to lay bare." "These are poems of the critic, the perpetual outsider, the haunted man, the insomniac. These are poems that peer deeply and delve into the parts of ourselves we might not like, but know. The collection works because the speaker is not exempt from his own penetrating eye, and because, as much as he details his cynicism, he is a lover of all that’s human and flawed. The most honest engine we have is the heart, and in this book, Dargan offers his." "The author’s note at the beginning of the collection, Dargan’s fourth, acknowledges the deaths of five people close to him within just a few years, experiences he says exceeded his previous 'thresholds of pain.' The ensuing poems look head-on at an end that stretches out beyond our imaginations, at the middle spaces between life, memory, and death. But they also address the pain of racial hatred and the pain that masculinity can confer when bravado goes unchecked." "Dargan must believe art can change people as he shows first what is good and then what disappointment can come from the lack of it. It’s a form of social action we can call the Textual Factor in intellectual leadership — or writing as a moral force. The poet knows what’s at stake and we get that in Dargan’s measured emotion, and his careful word. There are terrific lines in each poem, stirring from spiritual sources and sadness spawned from anger." "Dargan's book is exquisitely structured. The completeness of the conversations surrounding loss and pain is enviable, as is the richness of Dargan's world. Whether he is pulling from Gwendolyn Brooks, N.E.R.D., or the comic Watchmen, the poems remain relevant and grounded." "Dargan’s fourth poetry collection is an intervention involving ownership, not in the form of control, but in the form of self-acceptance. Through his relentless, enduring voice, we will ourselves to learn about taking ownership of one’s existence, especially when everything else is cosmically destined to crumble around us; and even if there aren’t any witnesses." Attempting to stitch a quilt of language for the new millennium, Kyle Dargan finds himself in his third collection propelled forward by a mélange of voices—individuals passed on the street, journalists, philosophers, movie and cartoon characters, hip-hop emcees, and fellow poets—all of which build to a self-diagnosed logorrhea dementia. Dargan’s voice channels an America mentally fatigued from a decade of foreign conflict yet cautiously hopeful about the promise of the country’s renewed introspection. In these poems, rife with the anxieties of the aughts, Dargan seeks to destabilize social and cultural landscapes believed to be settled—breaking and clearing ground to lay the foundation for a new American perspective. "Kyle Dargan’s third collection begins with something we rarely see in a volume of poetry these days — an honest-to-god manifesto entitled 'Breathing: A Preliminary.' In it Dargan concludes that he is 'tired of writing the poems I’m expected to write and whose language leads me to the places I’m expected to go.' As manifesto resolutions go, this sort of assertion is nothing new, but Logorrhea Dementia delivers upon its author’s promise, and often brilliantly so. Dargan’s first two collections are capable and shapely, but they don’t prepare us for the sustained imaginative ferocity and verbal swashbuckling of this new book. Indeed, the change in Dargan’s work seems to me as radical as that of an earlier poet at the same juncture in his career, James Wright." Kyle Dargan's new collection of poetry reflects his many passions as a poet, his deep engagement with what it means to work in the African American literary tradition, and his lively voice, infused with hip-hop sensibility and idiom. Skillfully blending vernacular and elegant diction, his clipped and reflective phrasings create animated poems that take on a myriad of concerns. Moving through such subjects as a midnight wait in the Washington, D.C., bus station, men on exhibit at the 1904 World's Fair, the sights and sounds of an Indiana karaoke bar, and an imagined escaped slave turned to stone, Dargan's work continually shifts lenses to examine an America increasingly stifled by dogmas and inept social categories. At the core of the book is compassion for the individuals who populate it, and from that compassion grows a hunger for the old identities, in which we encase ourselves, to come undone. Kyle Dargan's debut collection of poetry, The Listening, searches through the cluttered surface of contemporary life to tune into the elemental sounds within the marrow of living/life. Throughout the collection, Dargan interweaves elements of his heritage with the present day--jazz influences blend with hip-hop; neoslave narratives run parallel with the intimate tale of civil rights leaders; post-9/11 America is juxtaposed with family portraits of the sixties and seventies--to reveal the continuous, though ever changing, music of the world around us. Whether capturing the famous Ali-Frazier fight in Manila or a trip to the local barbershop, Muddy Waters or boyhood blacktop games, Dargan gives voice to the most poignant and fleeting aspects of our everyday existence. With singular incisiveness and vigor, these poems act simultaneously as psalms and elegies, praising life at the same time they lament its inevitable passing. "Kyle Dargan writes an attractive, melodic line that no one would mistake for prose [...]. 'The Listening' is right; Dargan has a marvelous ear."